Muscle atrophy, the loss of muscle mass and subsequent decrease of muscle tone, has a profound impact on orthopedic patients after injury and the post-surgical healing process. Recovery of muscle mass and function greatly extends the rehabilitation period, and some patients never fully recover. Studies have shown that this is particularly profound for the quadriceps muscle group, with total knee replacement patients only having about 60% quadriceps strength a month after surgery. The current rehabilitations process combine strength exercises and electrical stimulation, using Neuro-Muscular Electrical Stimulation (NMES) that repeatedly exercise the deficient muscle to improve strength and cognitive activation. However, traditional NMES sends large amounts of energy diffusely across the skin, not only causing imprecise muscle activation but extreme patient discomfort. As a result, patient compliance rates are often poor, negatively impacting the rehabilitation progress. The Arizona, US-based startup CyMedica Orthopedics is developing products that target joint injuries and the resulting muscle atrophy, and aim to give more patients access to high-intensity electrical muscle stimulation that’s often utilized to care for elite athletes. Their products, the QB1 Muscle Activation System, deliver a convenient, high-intensity NMES therapy individualized for each patient to accelerate physical rehabilitation and recovery at home or anywhere. Through a closed-loop technology, the smart system constantly monitors and adjust the delivered stimulation, enabling it to decrease discomfort and allow a more targeted and individualized therapy. The QB1 consists of an easy-to-use controller and a conductive garment, which can be used alone or with a low-profile post-operative brace. The conductive garment is soft and form-fitting, designed to provide a proper placement of the muscle activation electrodes. The controller unit is connected to the conductive garment, and generates and delivers the stimulation to the weakened quad muscles. Using the integrated touchscreen, the three times daily 20 minute sessions can be administered and intensity of the stimulation can be adjusted. The post-operative brace is an externally applied system that when attached to the conductive garment provides alignment, support and improved knee function after knee surgery. The system substantially advance the standard of care for knee rehabilitation, allowing orthopedic surgeons to treat every patient like a professional athlete by initiating neuromuscular activation immediately following knee surgery. It significantly simplify the delivery of high intensity electrical muscle stimulation at home, individualizing treatment while encouraging patient compliance. 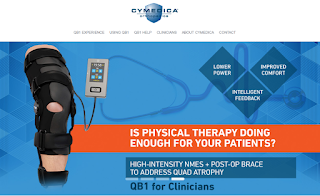 CyMedica Orthopedics has developed an innovative system that not only accelerate the rehabilitation process, but deliver full muscle recovery with greater comfort and convenience. The startup was founded in 2013, and the innovative QB1 system was already shown at the American Academy of Orthopedic Surgeons in 2015 with great reviews. Just a month later, the system was launched after receiving FDA 510(k) clearance. CyMedica Orthopedics has previously raised over $17 million and investors include Research Corporation Technologies, California Technology Ventures and Aphelion Capital.